Debbie G Productions presents a Spirituality Gone Wild Event with Satori Center for Wellbeing and Venus De Fido. With a common purpose to encourage wellness and promote community unity; this made for a natural collaboration with Debbie Gratitude, to produce an OUT OF THIS WORLD Mixer benefiting Shelter from the Storm. Get ready to Network, Learn, Enjoy Live Musical Experiences, Exhibitors, Shopping, Food and Fun. 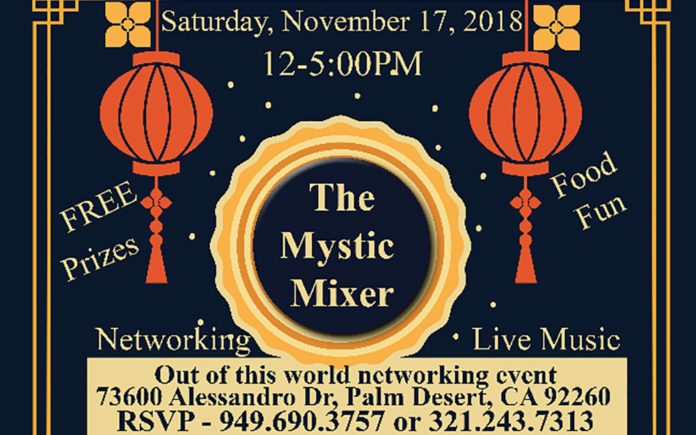 It’s a free event, November 17th, 2018 from 12 – 5pm, being hosted at our valley’s own, one of a kind location, Venus De Fido at 73600 Alessandro Dr. Palm Desert. The Mystic Mixer offers a grateful lineup of co creatives and Spiritual Guides. Join us for this beautifully grateful event where co-creatives can connect and collaborate on a whole new vibrational level with an incredible performance by Leon Hendrix, younger brother to the late, great, Jimi Hendrix. Leon will be sharing stories about his childhood being raised by Jimi, discussing Astral Travel and performing: “The Purple Haze Spiritual Experience” by Leon Hendrix. Other musical guests include Prince Fleet Easton and Joe Baldino. Your attendance also includes access to special Mystical offers provided by the Events Sponsors. You can experience a FREE 20 minutes of VibraSound Therapy from Satori Center for Wellbeing. You could redeem your 50% off Exclusive Gratitude Plan with Debbie G. You can enjoy discounts in the Venus Boutique and even buy one lunch and get one free from the Treats Cafe at Venus. Don’t forget to redeem your Grand Prize Entry by donating: a new item of clothing or new unwrapped toys for the holidays to benefit Shelter from the Storm during the Mystic Mixer. To find out more information about this event call (760) 834-7070 or go to venusdefido.com. Admission is free, please RSVP to enter a free drawing for a Salt Cave Experience. Next articleSHOULD I TELL MY INSURANCE COMPANY ABOUT MY DUI?